One thing I loved doing the most in Bhutan was people watching. The 'Faces of Bhutan' project is a collection of photos of Bhutanese people engaged in their daily activities. Every time I travel to a new place, I make sure to devout some time to my favourite activity – people watching. I love observing people as they are busy in their routine. Bhutan is the place where I met and observed some of the most interesting people. I spent three nights at a farm house in Paro, got invited to join Buddhist monks for a lunch, visited some interesting places, and ate delicious food while in Bhutan. The ‘Faces of Bhutan’ project showcases photos of Bhutanese people engaged in their routine activities. This is the second part of the two-part series. The first part of Faces of Bhutan is found here. ‘Faces of Bhutan’ is a tribute to the people of Bhutan. It’s a thank you for all their love, hospitality, and a memorable time. I would love to receive your feedback on this project. Feel free to add your comments. If you like this project, please share it with others. Note: All photographs copyrighted by Parvez Shaikh. Reuse of any of these photos is prohibited without prior arrangements. High resolution copies of these photographs are available for purchase. 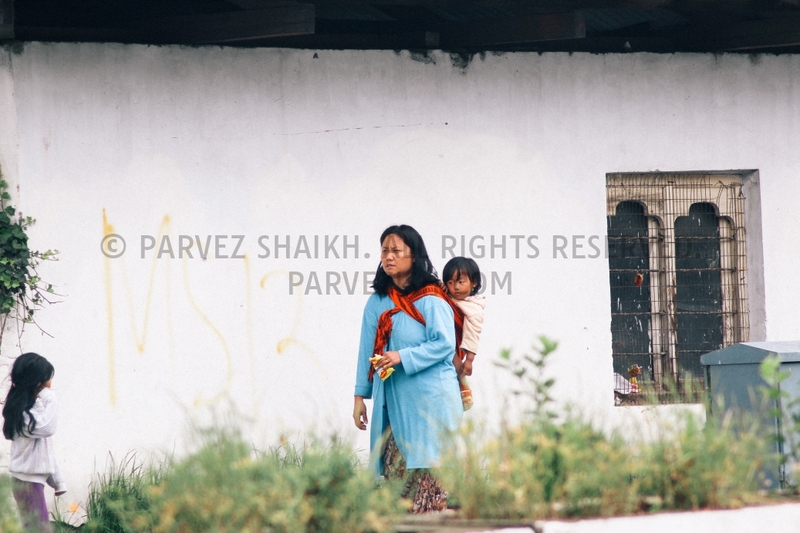 A Bhutanese woman carrying a child on her back with a pack of instant noodles in her hand. Thimphu, Bhutan. 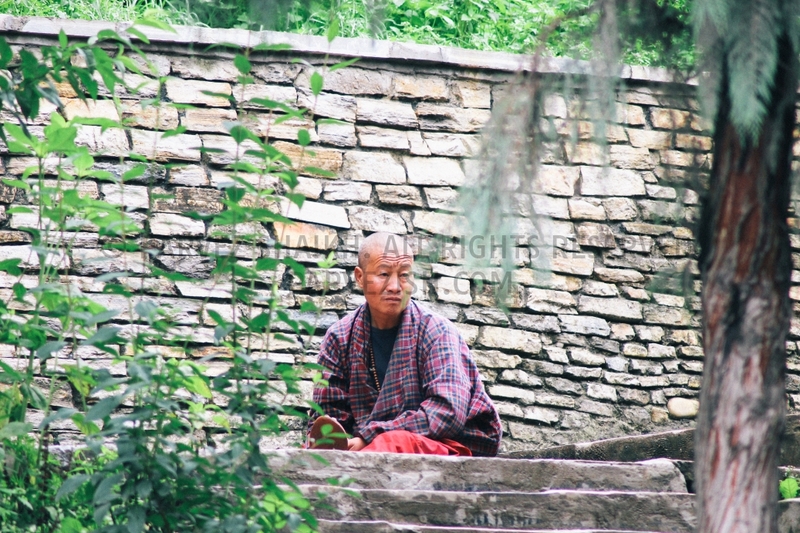 A Buddhist monk sitting outside a temple in Thimphu, Bhutan. An elderly man is photographed while praying at a Buddhist temple in Phuntsholing, Bhutan. 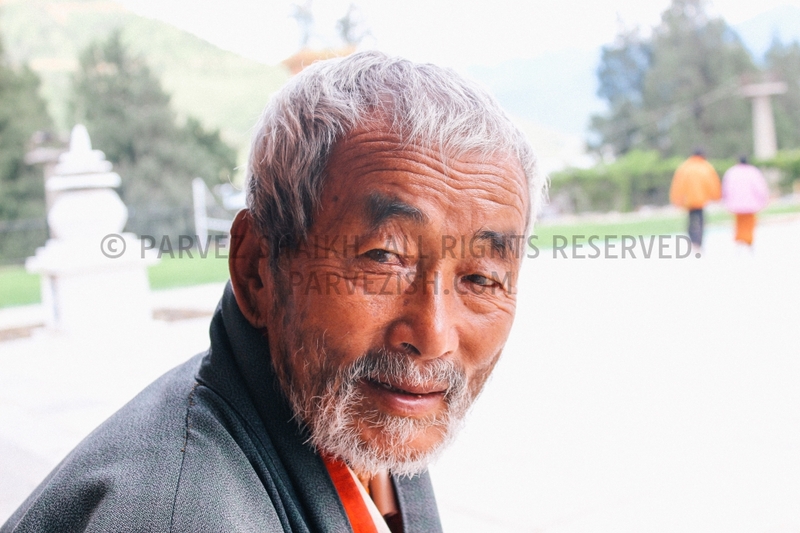 An old Bhutanese man photographed at Memorial Chorten, Thimphu. 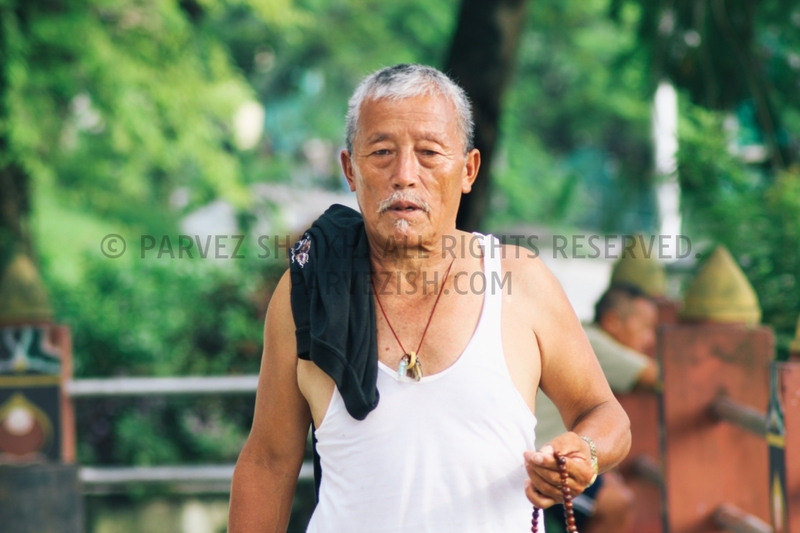 Elders are a common sight at Memorial Chorten throughout the day. 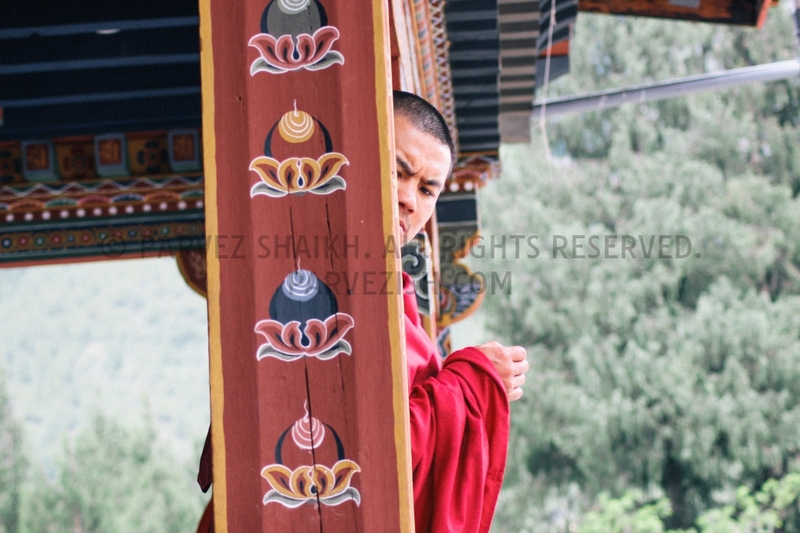 A Buddhist monk photographed at Memorial Chorten, Thimphu. 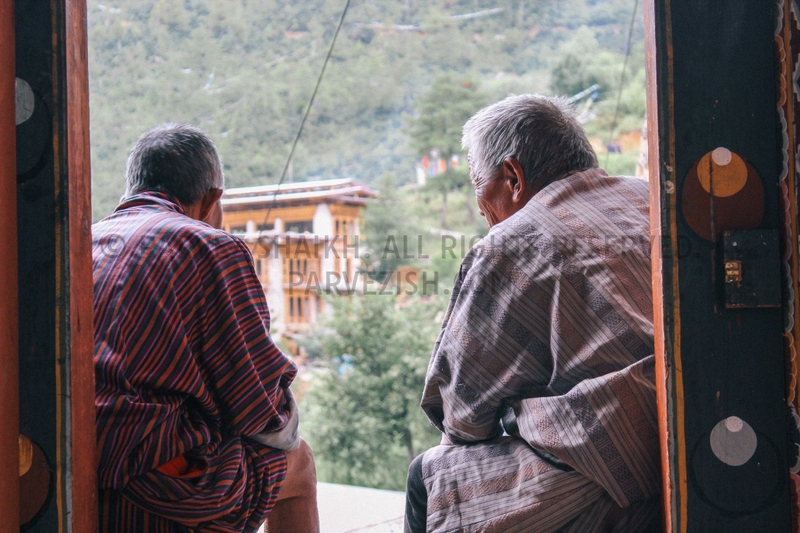 Two elderly Bhutanese men are busy in a conversation at Changangkha Lhakhang, Thimphu. 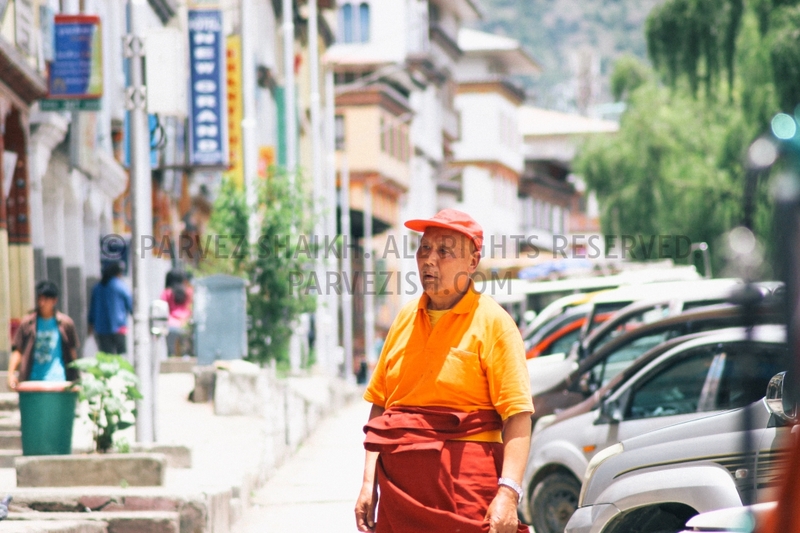 A Bhutanese man in photographed in a street of Thimphu. 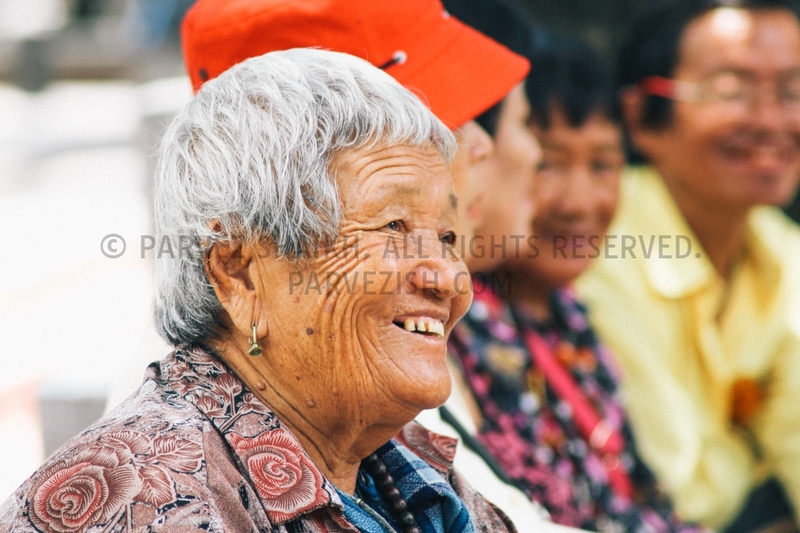 An old Bhutanese lady is smiling as she engages in a conversation with her friends at a temple in Phuntsholing. 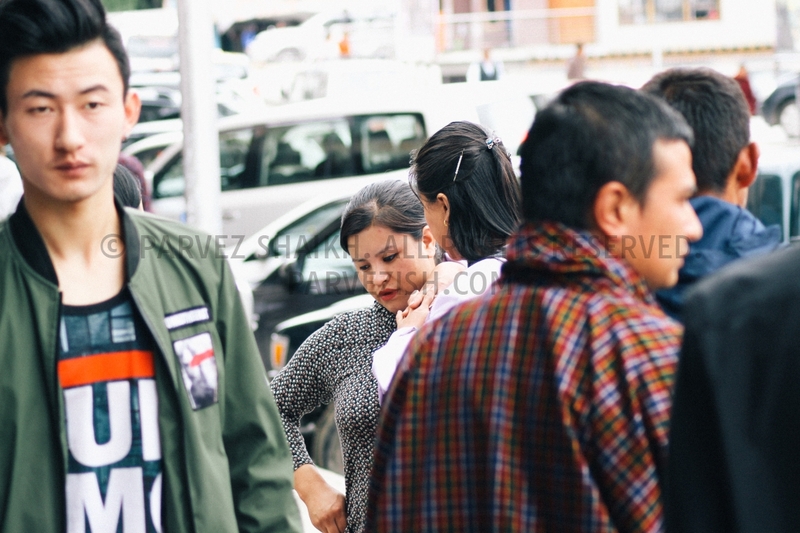 Two women are having a conversation in a busy Thimphu street. 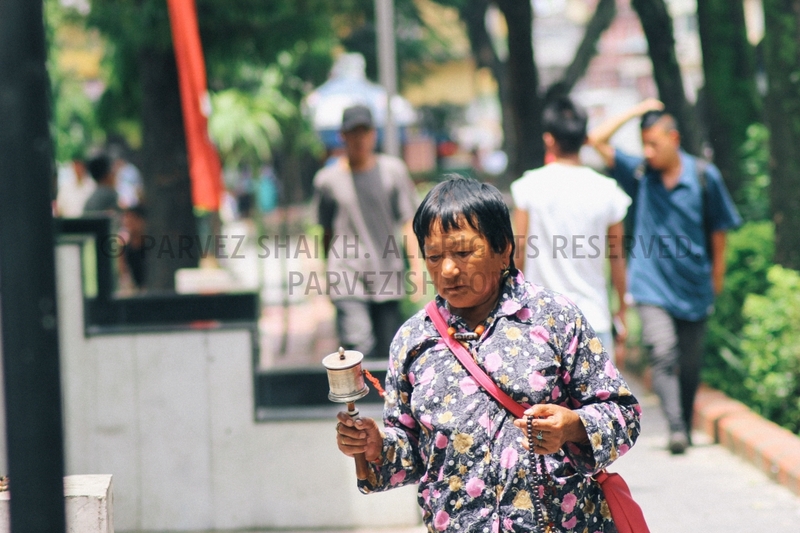 A Bhutanese lady is photographed spinning prayer wheels at Changangkha Lhakhang, Thimphu. 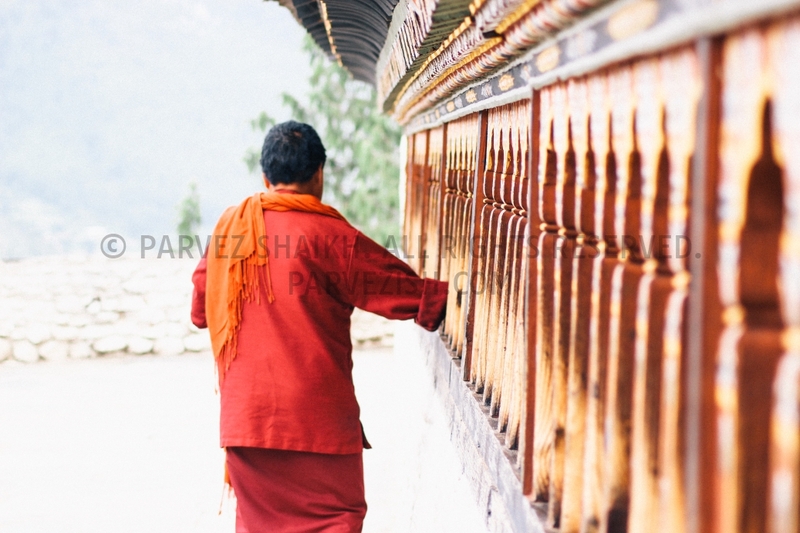 A woman is praying at a temple in Phuntsholing, Bhutan. 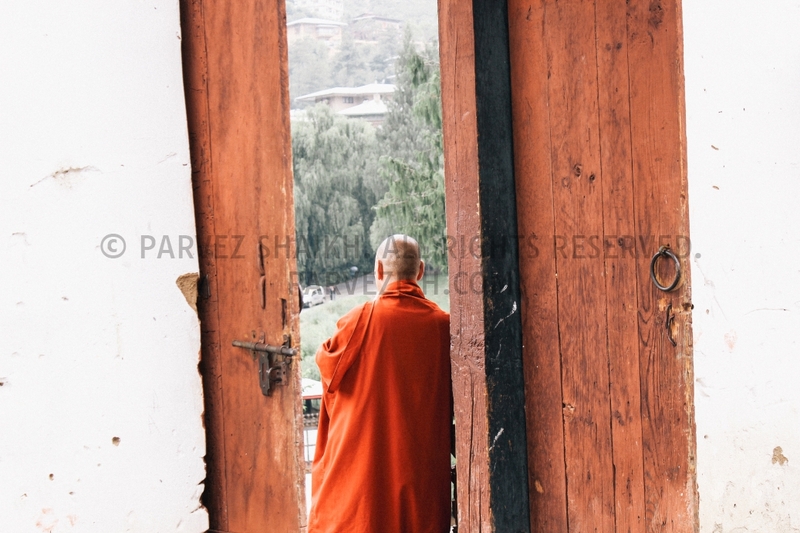 A Buddhist monk is photographed standing by a door of Changangkha Lhakhang, Thimphu. 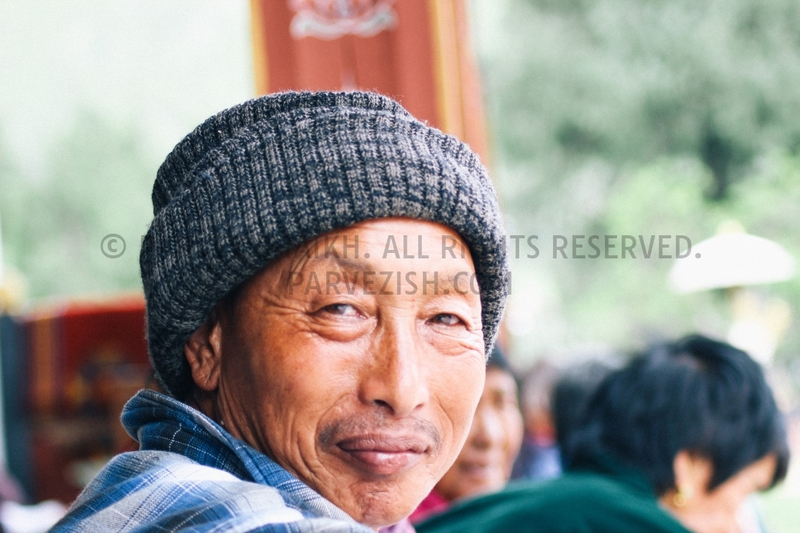 A Bhutanese man wearing Gho and a hat photographed at Memorial Chorten, Thimphu. Gho is the traditional and national dress for men in Bhutan. 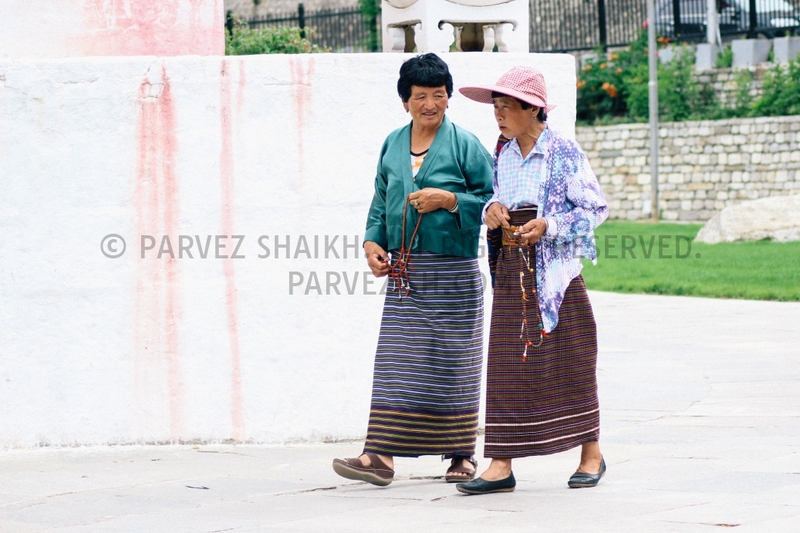 Two ladies dressed in Kira – the traditional dress for Bhutanese women – circling around Memorial Chorten while having a conversation. 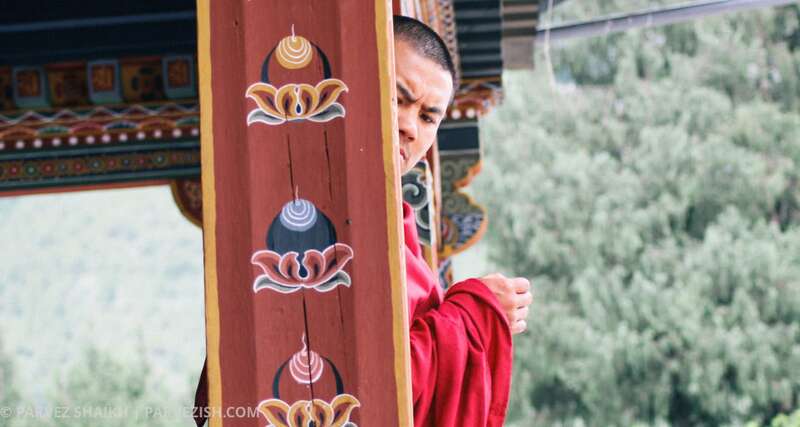 A Bhutanese man is photographed at Memorial Chorten, Thimphu, as he looks at the camera.